Pizza lovers rejoice! 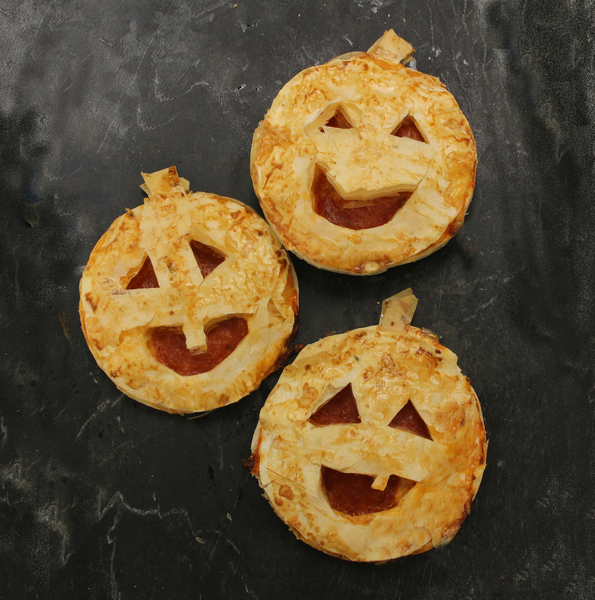 These flaky, festive pepperoni phyllo jack o’ lanterns are the perfect appetizer for your Halloween bash. Thaw one roll of phyllo, following thawing instructions on package. Preheat oven to 375ºF. Unroll and cover phyllo sheets with plastic wrap, then a slightly damp towel to prevent drying out. In a small bowl, mix together bread crumbs and parmesan. 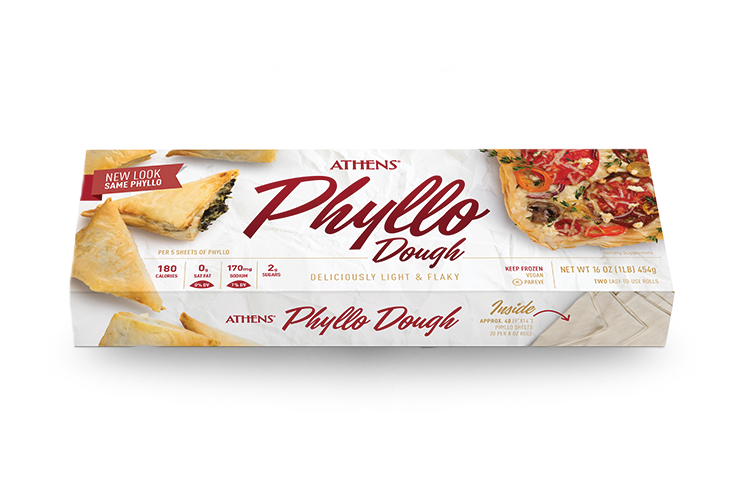 Place one sheet of phyllo on baking sheet. Lightly coat with cooking spray and sprinkle with breadcrumb mixture. Place a second sheet on top. Layer and repeat procedure with 3 more sheets but do not spray or sprinkle top layer. Cover with plastic wrap and repeat this procedure so that you have 4 stacks with 5 sheets of phyllo each. Using a 4” biscuit cutter or 4” diameter ramekin and a sharp knife, cut 4 circles in each stack. Carefully, cut simple faces in eight of the circles. From the scrap layers, cut 8 small rectangles for “stems”. Spread 1 teaspoon pizza sauce on each of the remaining 8 circles leaving a ¼-1/2” border without sauce. Sprinkle 1 tablespoon mozzarella on each and then top with three slices of pepperoni, still keeping perimeter clear. Brush egg on border and place circles with faces on top. Insert stem partially between bottom circle and face circle. Gently press around the edges of circle to seal. (It is okay if this does not completely seal). Lightly brush each with egg. Place on baking sheet and bake for 15-20 minutes or until lightly brown. A bed of lettuce is topped with shrimp and oranges and served in flaky phyllo tartlets with this great-for-entertaining recipe. 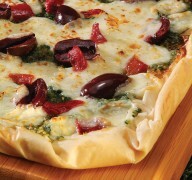 While fresh basil, Kalamata olives and red peppers give this pizza a flavorful punch, it’s the flaky Phyllo crust that really makes the dish stand out from the rest.